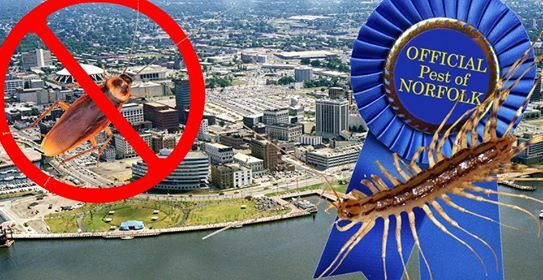 NORFOLK, Va. — After years locked in an intense stalemate over which household pest reigns supreme, the Norfolk City Council has announced that house centipedes, not cockroaches, will now be the official pest of Norfolk. The Peedmont is a proud to be a small business in Virginia; join our Patreon to help support us. The election has not been without controversy, with house centipedes repeatedly refuting accusations that they colluded with stink bugs to take the title of official pest of Norfolk. They have promised to fulfill their role with honor, dignity, and a profound creepiness. Rumors from within the cockroach community have indicated that a rogue faction of roaches is planning an uprising at Norfolk City Hall; however, there have been no confirmed reports to support this claim. According to a statement released by Centipedes of Tidewater, a house pest advocacy group comprised of thousands of centipedes from the Hampton Roads metro area, the house centipedes are both excited and humble over the recognition. Show your support for Virginia-based journalism; check out our online store.